The Empire State Building is currently the tallest building in New York City, New York, and the 2nd tallest building in the United States. It was the tallest building in the world from 1931 until 1972. 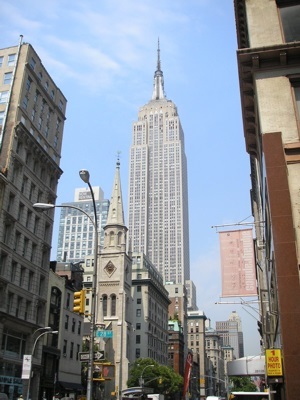 The Empire State Building is the landmark book on one of the world’s most notable landmarks. Since its publication in 1995, John Tauranac’s book, focused on the inception and construction of the building, has stood as the most comprehensive account of the structure. Moreover, it is far more than a work in architectural history; Tauranac tells a larger story of the politics of urban development in and through the interwar years. In a new epilogue to the Cornell edition, Tauranac highlights the continuing resonance and influence of the Empire State Building in the rapidly changing post-9/11 cityscape. The Empire State Building, a construction feat that to this day invokes awe and wonder, began as a contest between two industrial moguls who craved the status of constructing the tallest building in the world. The building was the center of a "race to the skies" competition between Walter Chrysler, of the Chrysler Corporation, and John Jakob Raskob, creator of General Motors, and coincided with the onset of one of the worst economic downturns in American history — the Great Depression. Thirteen Months to Go encompasses the optimism and potential of 1920s New York. It is a wonderful tribute to the perseverance of New Yorkers and an amazing story of fortitude and ambition. 150 photographs are featured. A rediscovered 1930s notebook charts the construction of the Empire State Building. The construction of the Empire State Building was orchestrated by general contractors Starrett Brothers and Eken, premier "skyline builders" of the 1920s. They scheduled the delivery of materials and the construction and recorded daily the number of workers by trade. Compiled from these records, an in-house notebook documented the construction process. Meticulously typed on graph paper and illustrated with construction photographs, this unique document combines a professional specificity of detail with a charming rhapsody to the firm's crowning achievement.Constructed in eleven months, the 1250-foot Empire State Building, the world's tallest skyscraper from 1931 to 1971, was a marvel of modern engineering. The frame rose more than a story a day; no comparable building since has matched that rate of ascent. People come from all over the world to see the Empire State Building. You can see all of New York City from the top of this tall skyscraper! Just how many floors does the Empire State Building have? And how long did it take workers to create this amazing structure? Read this book to find out! Learn about many remarkable sites in the Famous Places series - part of the Lightning Bolt Books™ collection. With high-energy designs, exciting photos, and fun text, Lightning Bolt Books™ bring nonfiction topics to life! Of all the great cities in the world, few personify their country like New York City. As America’s largest city and best known immigration gateway into the country, the Big Apple represents the beauty, diversity and sheer strength of the United States, a global financial center that has enticed people chasing the “American Dream” for centuries. Given that history, it’s fitting that the Empire State Building is the city’s most famous building, a soaring skyscraper that has been one of the tallest buildings in the world for nearly a century and the most recognizable landmark in New York. The Empire State Building was constructed using the Art Deco style, which was trendy during the era and had been used for other skyscrapers like the Chrysler Building, but that’s where the comparisons end, because the Empire State Building was unprecedented in almost every aspect at the time of its creation. With a race for dizzying heights underway, ground was broken on the Empire State Building on St. Patrick’s Day 1930, and the ceremony marking its completion would come just a little more than a year later. Employing thousands of workers and somehow managing only to lose 5, the gargantuan building soared to nearly 1500 feet tall before topping out. Ironically, it took awhile for the Empire State Building to attract businesses, in large measure due to the fact it was built at the height of the Great Depression, but before long it became synonymous with New York City itself. The building has generated notorious headlines, such as when a B-25 bomber crashed into the building in 1945, and it has been featured in too many movies to count, including its most famous role in King Kong (1933) just a few years after its completion. Indeed, the Empire State Building continues to be not just an instantly identifiable landmark in New York City but also a crucially valuable one that is still visited and used by thousands of people a day. 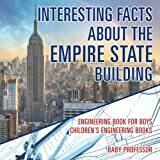 The Empire State Building: The History of New York City’s Most Iconic Landmark chronicles the construction and history of the Big Apple’s most famous building. 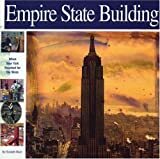 Along with pictures of important people, places, and events, you will learn about the Empire State Building like never before, in no time at all. If you’ve been to New York, you’ve probably seen the Empire State Building yourself. You’ve probably felt a great sense of awe as you look at this huge infrastructure. If you want to know how it was created, then you better open this book today. Let’s make engineering fun by carefully choosing resources to give to your boys. Of all the great cities in the world, few personify their country like New York City. As America’s largest city and best known immigration gateway into the country, the Big Apple represents the beauty, diversity and sheer strength of the United States, a global financial center that has enticed people chasing the “American Dream” for centuries. Given that history, it’s no surprise that New Yorkers have always wanted to construct the biggest and best structures possible, even in the early 1930s at the height of the Great Depression. Indeed, those years produced the Empire State Building, which remains the city’s most iconic building, but New York’s most famous skyscraper wouldn’t have been possible without the Chrysler Building, a landmark in its own right that was the tallest building in the world for nearly a year before its more famous counterpart’s completion. In fact, the spirit of competition between the groups working on the two buildings helped ensure that both look like they do today, and the Chrysler Building only reached the height it did because a large skyscraper at 40 Wall Street was also trying to claim the mantle of tallest building at the same time. The Chrysler Building was the first man-made object to surpass 1,000 feet in height, and while it has been surpassed by considerably taller projects since, it remains the largest steel-supported brick building in the world. As its name suggests, the Chrysler Building was named after Walter P. Chrysler, who ran the car company at the time, and yet his corporation never owned the building because he cherished it so much that he personally paid for the skyscraper and kept it in his family. Although it has since been sold to new groups, the name has remained, and the Chrysler Building continues to be a conspicuous part of the skyline in Midtown. It’s fitting that the Empire State Building is the city’s most famous building, a soaring skyscraper that has been one of the tallest buildings in the world for nearly a century and the most recognizable landmark in New York. The Empire State Building was constructed using the Art Deco style, which was trendy during the era and had been used for other skyscrapers like the Chrysler Building, but that’s where the comparisons end, because the Empire State Building was unprecedented in almost every aspect at the time of its creation. With a race for dizzying heights underway, ground was broken on the Empire State Building on St. Patrick’s Day 1930, and the ceremony marking its completion would come just a little more than a year later. Employing thousands of workers and somehow managing only to lose 5, the gargantuan building soared to nearly 1500 feet tall before topping out. The Race to the Top of New York City’s Skyline chronicles the construction and history of the Big Apple’s most famous building. Along with pictures of important people, places, and events, you will learn about the Empire State Building like never before, in no time at all.